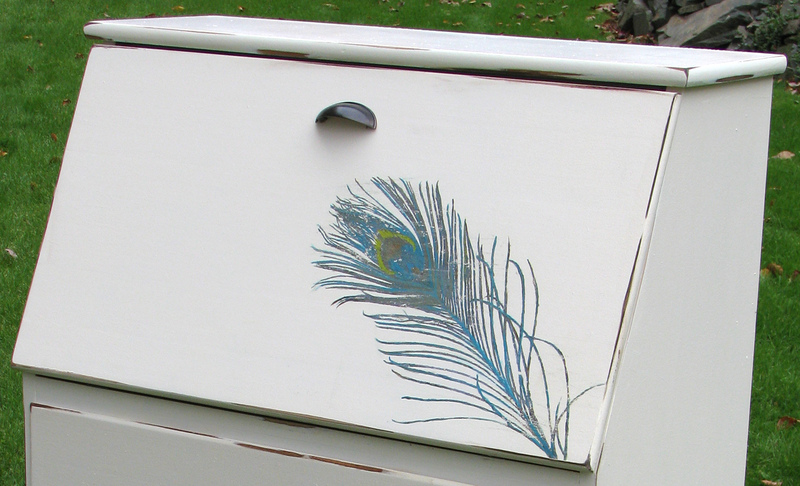 Okay, so I've been carrying around this old maple secretary desk intermittently for thirty years or so. It was my daughter's as she was growing up. (She's now a married Mum to four boys...when did THAT happen!?) So, as with other pieces of furniture in my past, this one has been recycled through children and friends over the years, and it came back to me (in it's "still-functional-but-"dated"-condition") when my adult son relocated to Ontario. After a lovely coat of primer (Zinnser Bin Cover Stain...my FAVOURITE) I used my go-to colour...Martha Stewart Heavy Cream, morphed into knock-off chalk paint with calcium carbonate, and painted the inside with ASCP Arles...such a lovely soft gold. 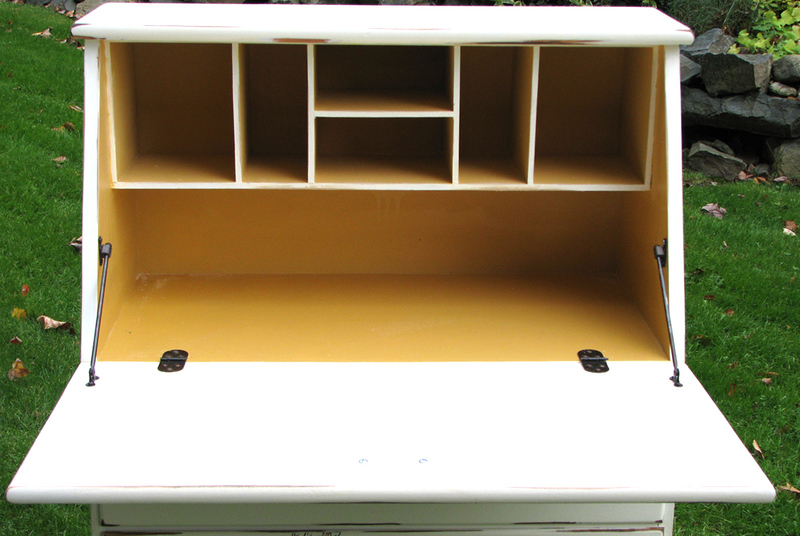 Painting the fronts of those cubbies with white was a major PAIN, but I liked the extra bit of definition that gave the inside. Okay, done, but SOOOO boring, especially when it was closed. So I switched out the hardware for cup drawer pulls, painted them with Rustoleum Rubbed Bronze...looking better...more up-to-date..."and THEN!! AHA!! GOT IT!! I went back into my bookmarks and found this post over at Tracy's place...PERFECT little bit of OOMPH for this piece, I thought. Please oh brilliant ones, tell me what YOU think. Just be gentle 'eh? Partying here and with these fine bloggers, and thanking them for all their dedicated linky party work. 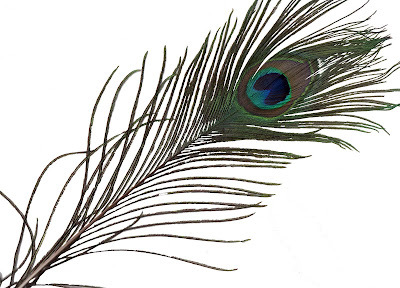 Here are the scanned peacock feathers I used, if you'd like to play! THANK YOU so much for visiting today...I'll visit YOU too if you leave a link. 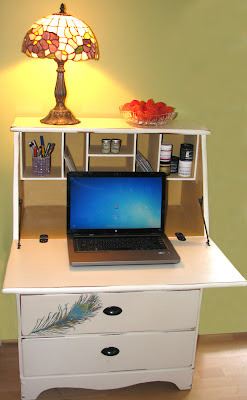 THANK YOU to Amy and Emily and Courtney and Kelli and Dr Jaime for so generously featuring my desk at their linky parties...DO pop over to visit these blogs for some fabulous inspiration! Wow...I love this! The peacock feathers definitely make the piece pop! Very cool, Love the idea of scanning the feathers. So creative. Beautiful! So updated and functional! That is stunning. I have a bit of a peacock obsession at the moment and that is fantastic. I love it! I need peacock feathers in my house immediately! Stopping by from I Heart Nap Time! You really took it to a new level with the peacock feathers. Really made it pop! Thank so much for stopping by my Sunday's Best Party! I think this looks amazing! You really did an outstanding job on those feathers. This looks fantastic!! I like how its very different from most pieces I see. Absolutely gorgeous...thx for visiting me because I found your blog. Your work has inspired me to do more. now that is cool. i mean it. totally the funky and colorful kind of cool. Wow! Such a nice suprise to see something unexpected way cool!!! I LOVE the peacock feathers!! It looks fabulous! you do everything with care and love & this shows. I can picture it in your warm and fresh home. great work! Love it!!! i am a little obsessed with peacock feathers!! I love this unique application!! found your post via tuesday's treasures and would love to have you visit and follow if you like what you see. cool! love the feather detail. great job. This turned out gorgeous! I love the peacock feathers!! That turned out fantastic! My sister has my grandmothers secretary hutch and I'm dying to get my hands on it! Thanks for stopping by my blog so now I found yours! Love this!!! I'm all about peacock feathers these days!!! Wow, that is really beautiful! How creative to use peacock feathers...well done! oh i just sighed out loud! i LOVE it!!!! I love the transformation. Very original, and the yellow pop inside is great. I also love that I am not the only one who uses MS Heavy cream as there go to paint. Wow, I really love the punch the feathers added. This looks amazing. 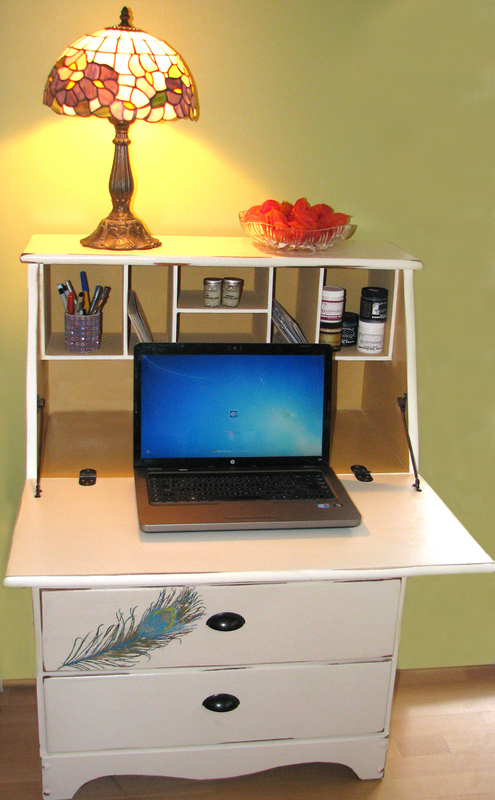 The feathers just pop - desk is updated, doesn't even look close to the original. Great spot to blog too. Fantastic job. I love the placement of the feathers and the pop of color is just what it needed! Totally amazing - I LOVE the peacock feathers. I can't imagine how tedious painting the front edges of those cubbies must have been!! I do love the combo of the white and soft gold. Looking forward to seeing what you come up with next (no pressure :). that is definitely the little extra it needed. fabulous, and i love the colors in the feathers. spot on. I'm not vert artsy fartsy so don't understand how you scanned that (on what) then got it on your furniture. I love the blues and greens against the white. Just fabulous. I'd love for you to link up to Fresh Friday Link Party on my blog! that turned out great.... and I love, love, love peacocks and their feathers! I absolutely love the peacock feathers, this turned out lovely. Also, Thank you so much for visiting my site and for the tip about my comment settings. Again, beautiful work! love this! my dining room has a lot of peacock feathers! supoer cute. Awesome! the peacock feathers look perfect on them!! Stopping by from Lorie's Show & Tell party. Looks great. 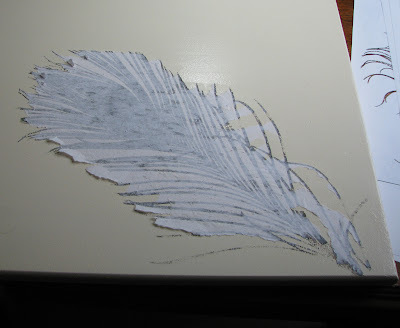 How smart to scan the feathers. You have my wheels turning! WOW!! What is not to like? It is amazing. I want. I want! lovin the feathers. great job! we featured you today. I found you thru Primitive & Proper...couldn't resist checking out your peacock desk! It's absolutelu stunning! Brilliant to scan the feather, I'm not sure how transfer paper works, I'll have to look into it. Thanks for sharing your lovely piece! Over from Primitive and Proper... I LOVE this!! Love the peacock feathers, love the image transfer technique. Stunningly beautiful! Thanks for sharing it! This is so pretty! Love you feathers and I see you are going to post an image for us too! Thank you in advance! Thank you for sharing your unique project with Potpourri Friday! You are such an inspiration!! Can't wait to try some of these projects myself! Turned out beautiful! So glad you linked up with us and can't wait to see what you link up this week! 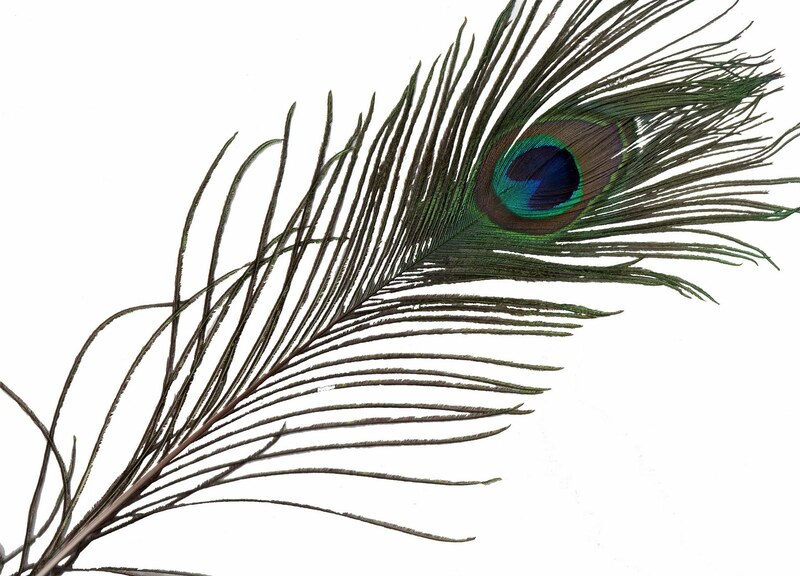 I am a big fan of peacock feathers! HUGE! Love this! Deborah I love the feathers. That's gorgeous! Really pretty! Thank you for joining me at Home Sweet Home! Great idea and I love the finished project. 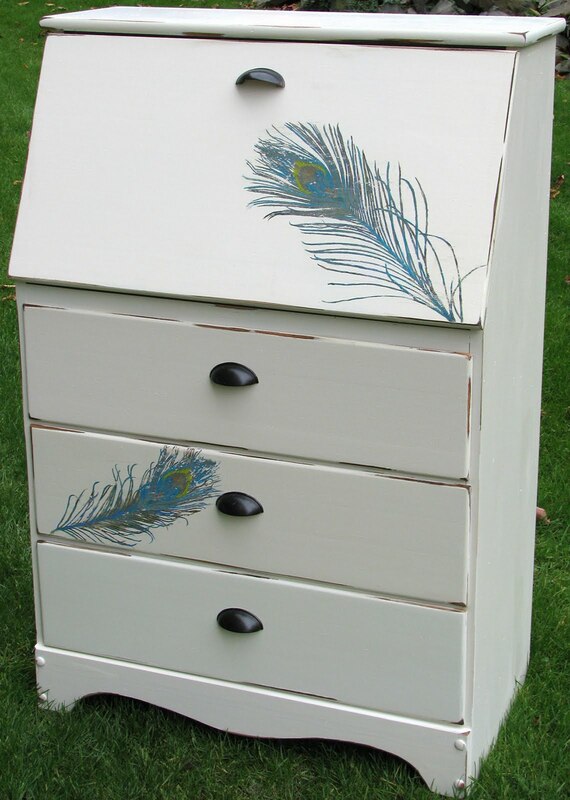 I feel a little rude though I don't mean to be but I used to work in a small reproduction furniture shop finishing with milk paint and if you don't mind I'd like to share the secret of realistic distressing. Most wear is where your hands or feet naturally touch. 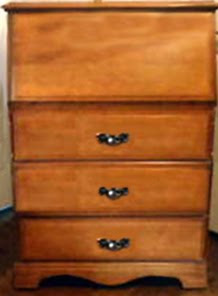 So the bottoms of any legs, around the handles, and on the edges where people would naturally bump them, the tops of drawers and the edges of doors where they open. All the best from another older than dirt Maritimer.